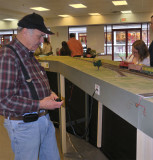 HO scale Free-mo modular meet in Lodi, Ohio. Michgan modules unloaded and ready to assemble. Underside of a completed Free-mo module. Peering down the mainline from one end of the layout. John and Wayne discuss scenic elements. Another view of the end module. The other end of the layout. Phil switches cars around in the small interchange yard. A closer crop of the previous image.